In many of my applications I use a CRC/checksum to verify that the code/flash on the target is not modified. 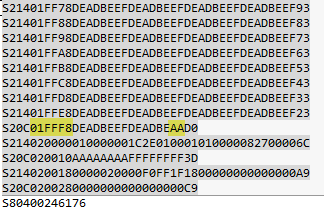 For this, not only the code/data in flash counts, but as well all the unused gaps in the memory map. Instead to leave it up to the flasher/debugger (which usually erases it to 0xFF), I want to fill it with my pattern. The GNU linker is using the pattern 0×00 for unused bytes inside sections. So this post is about to use the GNU linker to ‘fill’ the uninitalized FLASH memory with a pattern. Including =fill in a section definition specifies the initial fill value for that section. You may use any expression to specify fill. Any unallocated holes in the current output section when written to the output file will be filled with the two least significant bytes of the value, repeated as necessary. You can also change the fill value with a FILL statement in the contents of a section definition. :! : The =fill applies only *inside* an output section, so does not fill the space between output sections! Specify the “fill pattern” for the current section. Any otherwise unspecified regions of memory within the section (for example, regions you skip over by assigning a new value to the location counter ‘.’) are filled with the two least significant bytes from the expression argument. A FILL statement covers memory locations after the point it occurs in the section definition; by including more than one FILL statement, you can have different fill patterns in different parts of an output section. While the above =fill and FILL() examples are fine, they only fill *inside* a section. The linker will place my code and constant data into the m_text output section. I will not fill up all the 128 KByte of FLASH, so the end of m_text will not be filled with the above examples. 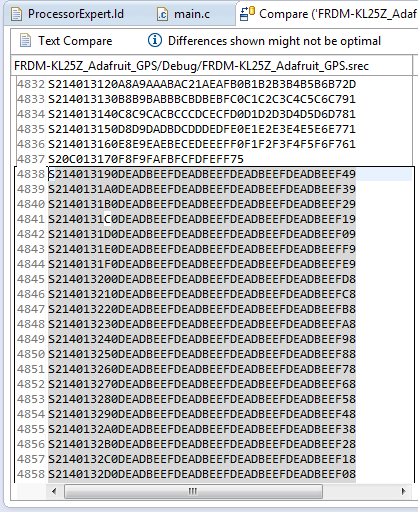 So how to fill the rest of m_text up to the address 0×1′FFFF (end of FLASH memory)? Writing a value to that location with the BYTE() command. Note that this byte is technically needed, as the linker needs to have something in the output section. Defining the ___ROM_AT symbol. My linker file is using that symbol later. If your linker file does not need this, you do not need this line. Filling the unused FLASH memory with a defined pattern is a very useful thing: it makes the memory defined e.g. for a checksum calculation. Additionally it can increase the reliability of an application: I can fill the FLASH memory with an illegal instruction or HALT instruction: so when my application would jump into undefined memory, I can bring the system to a screeching halt. To use a fill pattern inside a section is very easy with the GNU linker (ld). To fill unused memory outside of output sections, I’m using a dedicated .fill section as shown in this post.